What is a Security Deposit Return Letter? A Security Deposit Return Letter is used by a landlord in the real estate and rental field. This document is used by a landlord in the real estate and rental field. This letter will be used to inform a tenant about the return of security deposit they will receive after moving out of a rental property. This document should be used in order to provide the tenant with a record of their deposit and any deductions that were taken out by the landlord. The letter should include contact information for the tenant and the landlord in case there is a dispute. The address for the property should also be detailed. Information about the deposit can be listed. This should include the original amount of the deposit and the amount being returned to the tenant or of any balance due. The landlord should detail what the deductions are and why they were taken out of the full amount. The landlord will also need to sign the document. 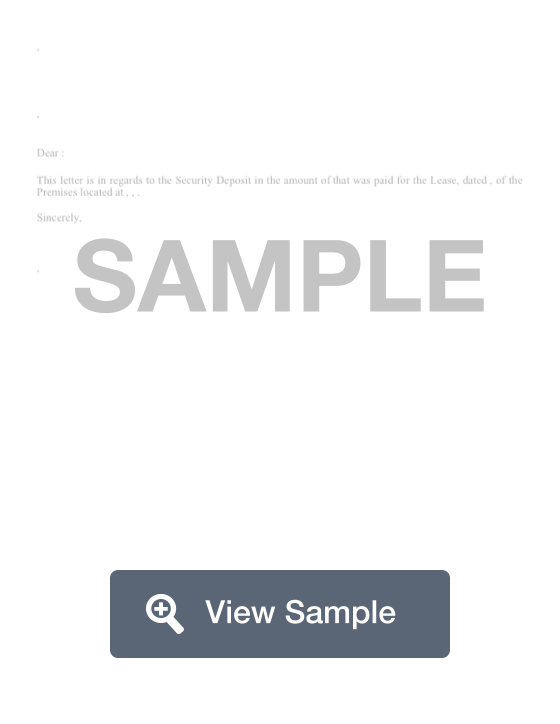 Create a free Security Deposit Return Letter in minutes with our professional document builder. When should you use a security deposit return letter? You should use a security deposit return letter if you are returning a tenant’s deposit and you want to provide the tenant with written notice of the deductions that were taken from the security deposit. Any deductions that you take should have been specified in the landlord tenant lease agreement. This document will protect you and show that you’ve met your legal responsibilities as a landlord. The letter creates a record of the date and the amount returned. This letter is sometimes required by state law. You may also be required to send this letter via certified mail. Once you have included all of this information, sign and date the letter. Your letter must comply with applicable state and local landlord-tenant law. In some cases, it is difficult to prove the condition of the property before and after the tenant had possession of the property. It is important to document the condition of the property thoroughly. This can be accomplished by having the tenant sign off on a condition checklist, taking photographs of the property before move in and after move out, or having a non-tenant witness examine the property and sign statements about the property’s condition. A landlord can deduct money from a security deposit to pay for cleaning a property after a tenant’s departure, but only to make sure that the property is as clean as it was before the tenant moved in. A landlord cannot deduct for routine cleaning to prepare the unit for the next tenant. If you have any questions about what deductions are proper when you return a security deposit, you should seek out legal advice. A landlord should be sure to include detailed information about the amount of money that is being returned from the security deposit.